We got hands on with All Bar One’s new Eastern Med cocktail and nibbles menu! Smoked BBQ bosses HotBox have just launched a tapas style sharing summer menuA one day pop up pug cafe is coming to Shoreditch in London!The Pink-est Afternoon Tea in London? All Bar One have launched a brand new menu inspired by tastes of the Eastern Mediterranean. With zingy cocktails, spiced nibbles and a whole lot more we got a chance to get hands on with the new menu mixing our own cocktails in their shiny Leicester Square branch. The cocktail menu takes staple drink favourites and gives them a splash of Eastern flavour. There’s a Lebanese G&T and Spiced Ice Tea, plus fruity hit Pomegranate Sour and Superfly Club. Visiting their lovely team in store, we had a go at being one of their top bartenders, mixing our own Spiced Ice Tea and Superfly Club! The new menu is great for anyone wanting to transport themselves into a sunny setting, even if it was pouring down outside. 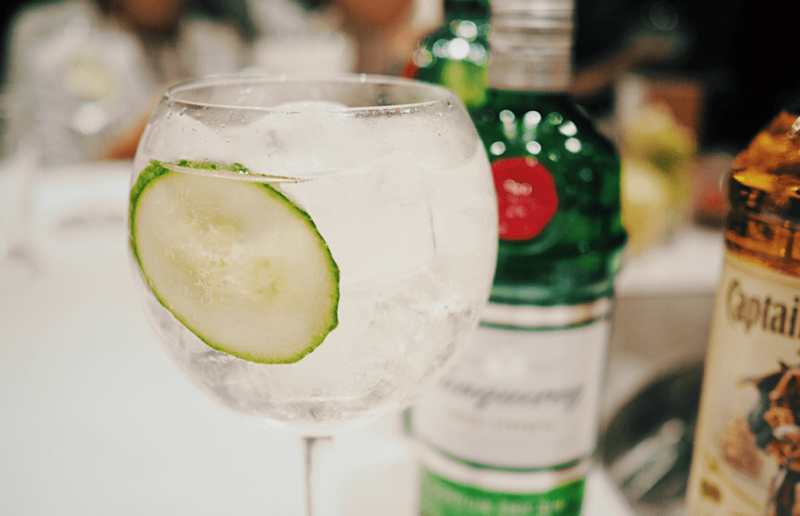 The Lebanese G&T features one of the best gins you can have in a drink, Tanqueray’s 10 Gin, plus ginger and lemongrass tonic water, and is a welcome update on the staple Gin and Tonic. It’s softer, not as a sharp but full of flavour. 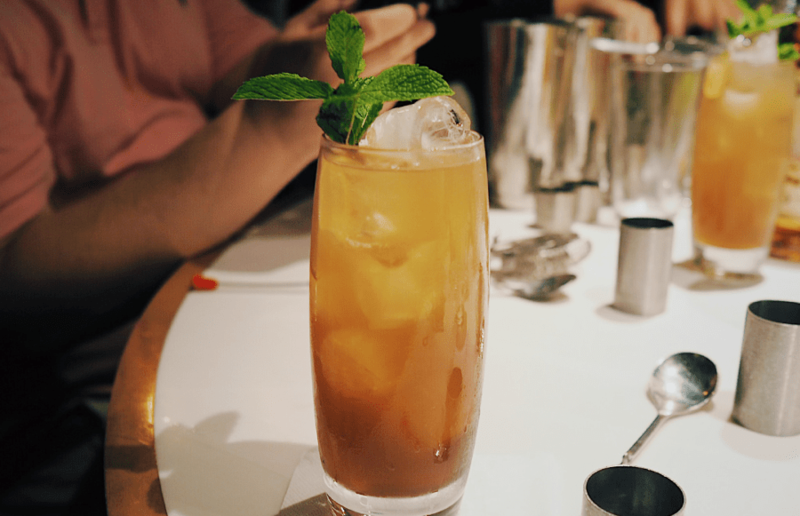 Mixing our own version of their take on a Long Island, it quickly became apparat that it’s more than just pouring liquids into a glass – there’s a real skill to it, and something that make take us a few more attempts! The new menu uses top spirits across the whole range, with the The Spiced Iced Tea featuring Captain Morgan Spiced rum, Tanqueray gin, Smirnoff Black Vodka, and spiced syrup with fresh lime and cola. Tippling the cola in slowly,you can create a smooth ripple effect which looks pretty neat. We also had a go mixing up a Pomegranate Sour which was our fruity favourite. It’s a sweet drink with Ciroc Pineapple vodka shaken with Campari, pomegranate puree, grenadine, lemon juice and egg white topped with pomegranate seeds. If you like a fruity cocktail this could be your new summer favourite. It’s not just drinks on the new Eastern Med menu either, with some great sharing plates including the All Bar One Lahmacun with spiced minced beef, and green harissa houmous or crumbled feta, yoghurt and spinach topped Spinach and Feta Pide. They’re perfect to nibble on whilst catching up with a group of friends – or for a more laid back date, without the worry of ordering at a restaurant. There’s also bigger plates with Lamb Koftas and Chicken Meshwi, and tasty flatbreads to dip into their beetroot houmous and Kalamata olives. All Bar One’s new Eastern Med cocktail and nibbles menu is running now across their venues nationwide. Find your local on their website here.